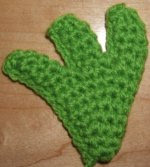 I've just finished figuring out how on earth to crochet a small green foot (which will form part of my next exciting free crochet pattern) and I just had to take a quick footo (oops - photo!) to show it off. Hopefully with a little more work I'll have a lovely new pattern to share with you... it may take me a few more days though! Until then I think I may also have a go at the lovely pattern for a frog which is freely available from the roman sock blog. Can you tell that I have a stash of green yarn that I'm trying to use up?